Black Stripe on Hood. White, Yellow and Orange Flames on Sides and Hood. 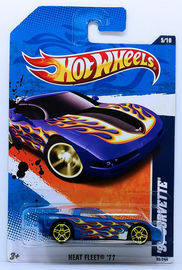 Corvette Emblem on Front, Hot Wheel Logo Rear Fender. Engraved Hot Wheel Logo Rear Window.